If you haven't already guessed from the title, the next new seasonal color will be called Plum! It was a nail biter all the way to the finish, ending up in the closest vote in Puzzle Pirates history, closer even than yesterday's office lunch order, in which "Chinese" beat out "a knuckle sandwich" 4 votes to 1. Keep your eyes peeled for a Mystery promotion featuring Plum later this summer. An enormous thank you to everyone who voted! You're the real heroes. Congratulations, Plum! Don't blow it. More colors, more themed vessels, more furniture but no more exciting gameplay, just 'display' content. That's why I stopped playing. If that's how this game sells subscriptions and dubs I am not interested on it anymore. Anyways thank you for the fun I used to have. Same here, used to play all the time couple years ago and have been on only a couple of times since then. Unfortunately this game just doesn't evolve. It's sad cause this games has so much potential just wasted on "....let's name another color!" stuff. C'mon guys this is the only game out there like this, let's get some gameplay updates. I check back now and then hoping there will be a reason to jump back in but it hasn't really happened yet. "Knuckle sandwich" should have been a color choice. Haunted seas and cursed isles aren't new gameplay bits? Come on people they have been doing more than just colors. Haunted Seas and cursed isles were steps towards the correct direction but... they are just the mechanics used in the Sea-monster Hunts. You have an forage island, you have monsters ships/ghosts ships/cursed ships, also when you get to the island there is a puzzle to gain treasure chests, and there is a recurring theme of boarders in these adventures. 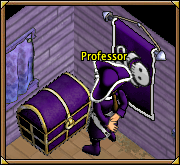 Did I also mention that you need a badge for it all, not the labor badge for the foraging or the pirate+ for using the ship. This game was created by a brilliant team but they seem to have stopped. After moving on to other games I've noticed the games that keep it fresh stay in touch with its community and supply them with the content they ask for.